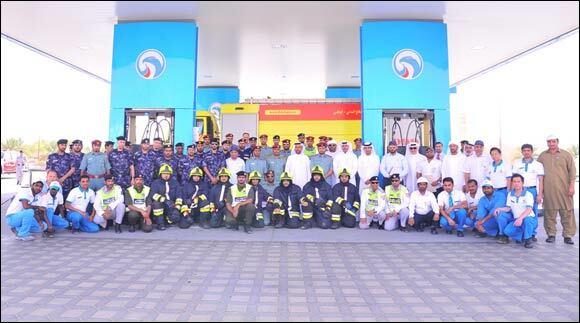 Al Ain - UAE: 13 May, 2014 – ADNOC Distribution organized a simulation fire and evacuation drill at Mazyad service station in Al Ain. The fire drill was held in collaboration with Abu Dhabi General Civil Defense Directorate, and Al Ain Emergency Directorate, as well as several divisions of Abu Dhabi Police such as Department of Special Tasks, Traffic Department, Department of Emergency and Safety, Quick Intervention Center and Community Police. In addition to assessing the risk management measures in place the fire drill also aimed to test preparedness and readiness capabilities internally as well as externally in handling emergency scenarios. It also served as an opportunity to test actual simulation of site personnel response, external and internal communication, equipment handling, response time and mutual aid agreement. Such exercises allow the company to respond to emergencies in the most effective manner in case of real time crises. The outcome of this exercise will be recorded to identify any potential areas of improvement.